However I have found another bag that I think is worth mentioning for several reasons. It is stylish and fun! Plus I love the bright bold color red. It’s much smaller than my Epiphanie so when I am going out quick and not really planning on taking pictures I can discreetly take it with me just incase the opportunity arrises. I hate saying “man I wish I brought my camera!” when I see something photo worthy. 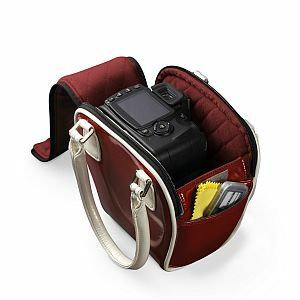 Here it is – The Acme Bowler Camera Bag! I just received my bag in the mail yesterday and I was pleasantly surprised with the quality! The inside is padded very well! 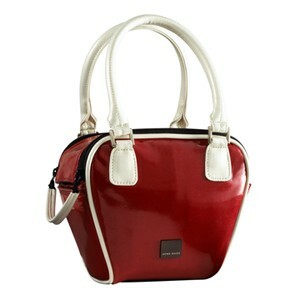 I love how the top zips open and that there are two little pockets on each side on the outside of the bag. The inside of the bag has a nice velcro divider which you can take in or out of the bag. It holds my camera body and one lens. It is just what I wanted for when I didn’t want to or need to carry all my gear with me.